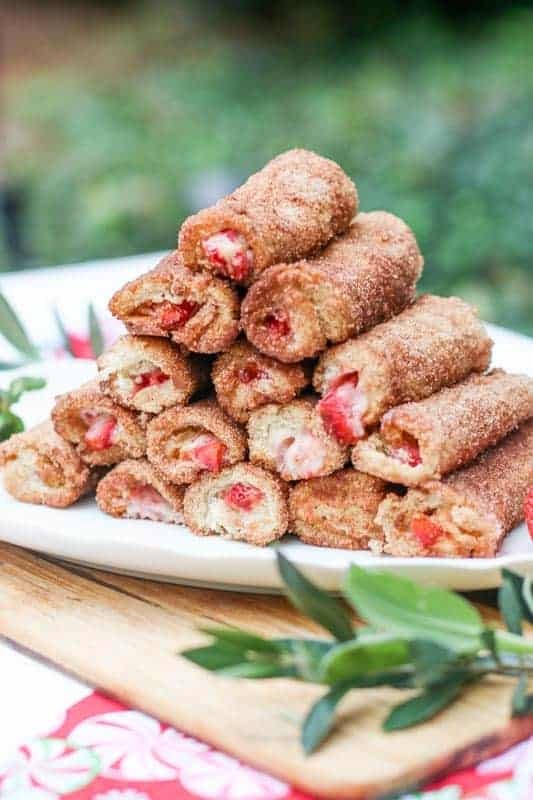 These strawberry cream cheese french toast roll ups have a crunchy, buttery, cinnamon and sugar crust and gooey strawberry cream cheese filling. They are great for entertaining because you can pick them up with your hands like french toast sticks. 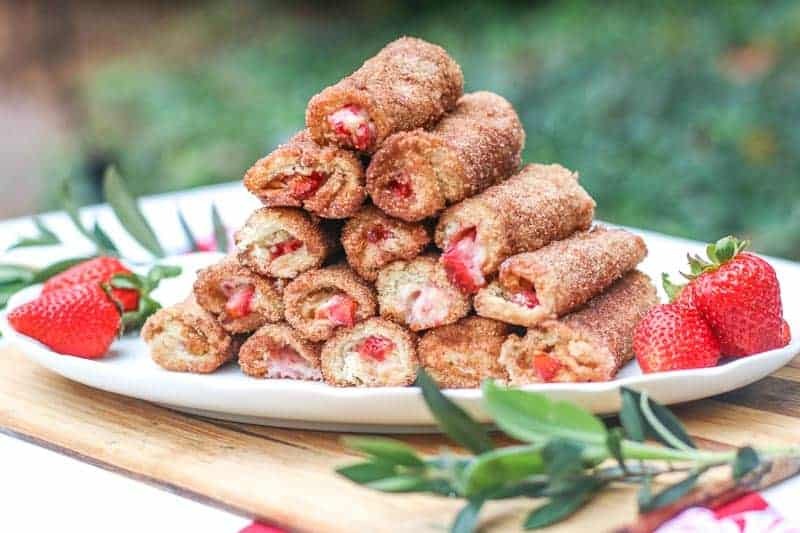 Make these for your friends and family and they will feel extra special. I am a free-lance writer for CityView Magazine in Fayetteville, NC. I love being able to contribute articles to such a beautiful, well designed magazine. 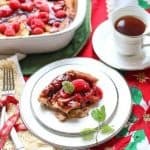 I recently wrote an article for them called, “Breakfast for the Holidays” featuring four delicious breakfast dishes perfect for entertaining during the holidays and included this strawberry cream cheese french toast roll ups recipe along with my Jalapeño Cheese Grits and Make Ahead Raspberry French Toast. They are absolutely DELICIOUS!!! 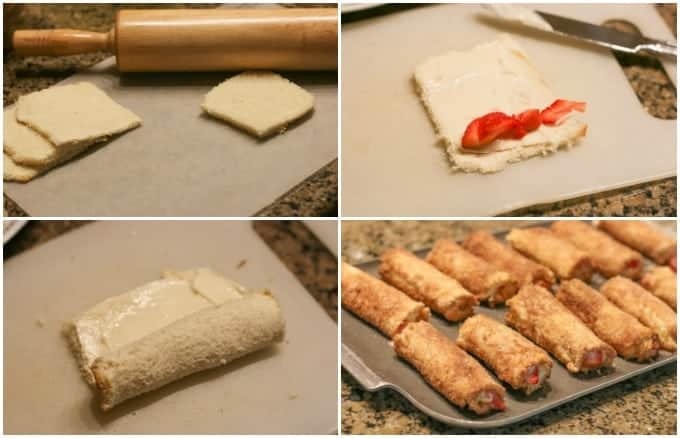 Here are step by step instructions on how to make french toast roll ups. You take a loaf of bread slices and cut off the crust. Then you roll them flat with a rolling pin. You make the filling and then spread the filling on each slice of bread. Then you add strawberries along the bottom of each slice. Next you roll the bread tightly, starting with the strawberry end. The cream cheese filling will seal the edges. You brush them with melted butter, then dip them in cinnamon and sugar. Then you bake them. They are delicious when warm and at room temperature. Cut crust off of each slice of bread. In a mixing bowl, combine cream cheese, powdered sugar, and vanilla. Beat until smooth. In another bowl combine sugar and cinnamon. Set aside. Spread cream cheese mixture evenly on each slice of bread. Roll bread up tightly starting with the strawberry end. Cream cheese filling will keep it sealed. Brush melted butter on the entire outside of each roll. Dip and roll each roll-up into the cinnamon and sugar mixture. Bake in oven for 20 minutes or until a golden brown. You can make these roll-ups hours ahead. To reheat them, place them on a sheet pan and bake them in a 350 degrees oven for about 5-8 minutes or until warm. If I want to make these in a m before p m party what is best way to store them. Or can they be made night before? No. Not this recipe. Sorry. can they be made sugar free or low carb? Glad you like them! This warms my heart. 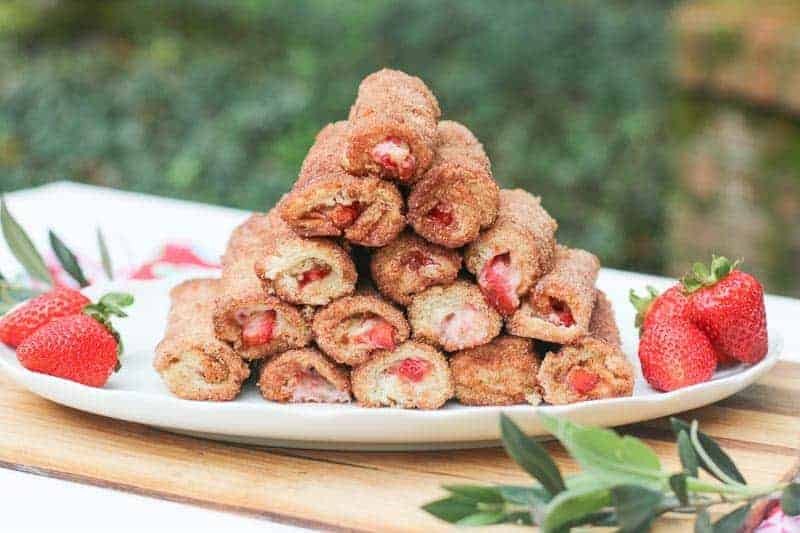 Love Love Love these Strawberry Cream Cheese Roll Ups! They are a holiday favorite. Patty, I am sure the apples will be great in these. For autumn I think that I will try this with sauteed apples instead of strawberries! 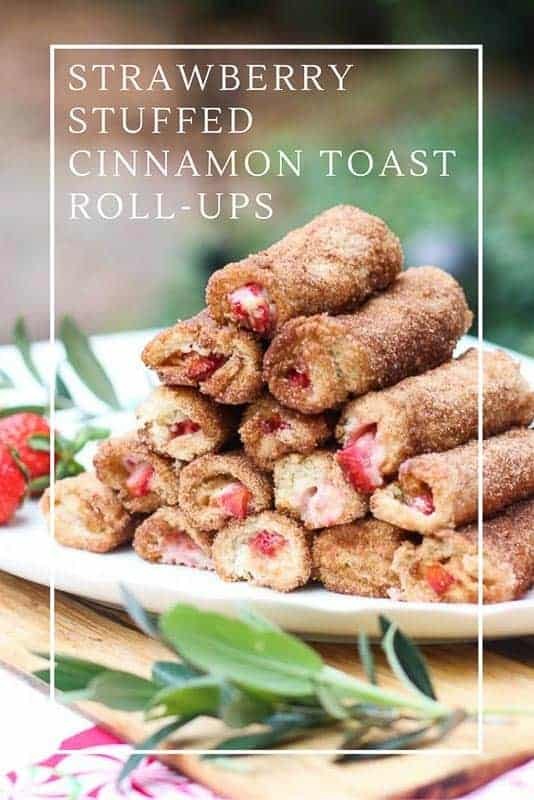 What a fab idea for party snack. My little missy will love it for her after school snack. I loved the way these rolls are stacked up. I love how you stuffed these roll ups. 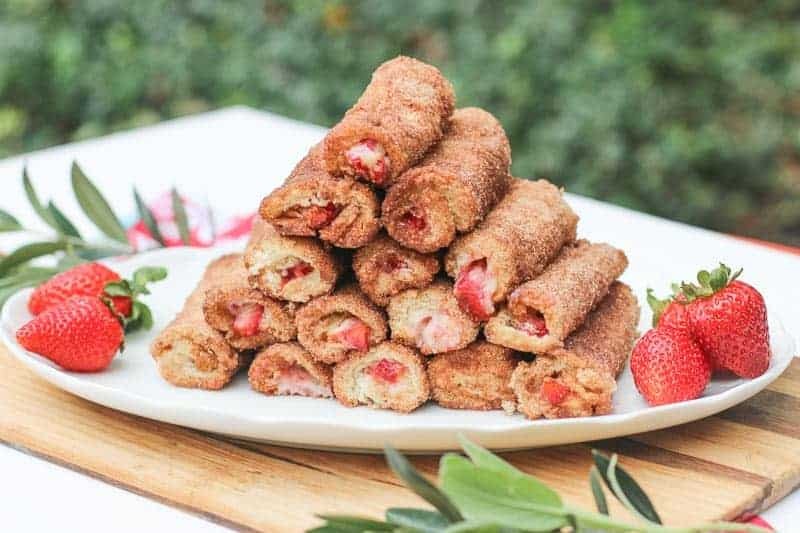 I think that strawberries and cinnamon is great combination of flavors. YUM! These look so delicious- I love the addition of the berries! This has Christmas morning written all over it! Another great idea that my kids would love to make. I can see them eating them before the served at the table- lol. Love the ease of prep and the delicious user friendly ingredients. Now this is a fun idea that I can get behind! I love this idea, it looks and sounds delicious! Such a cute idea! They seem super customizable too!